Shelf versus custom pistons. What's the differences and what are the options? We give you a high level overview of where custom pistons differ, including billet. It's time to build a new engine, and you have done all of your research, developed a spreadsheet full of applicable part numbers for your shiny new crankshaft, new connecting rods, new cylinder heads, and more. But one thing is still up in the air – you simply can't decide which pistons you need. At a manufacturer like JE Pistons, there are hundreds of piston part numbers on the shelf, but not a single one truly fits your application. Maybe it has the wrong compression ratio, or you need a specific ring pack that isn't offered in one of the company's shelf-stock pistons. This is where a custom piston comes into play. 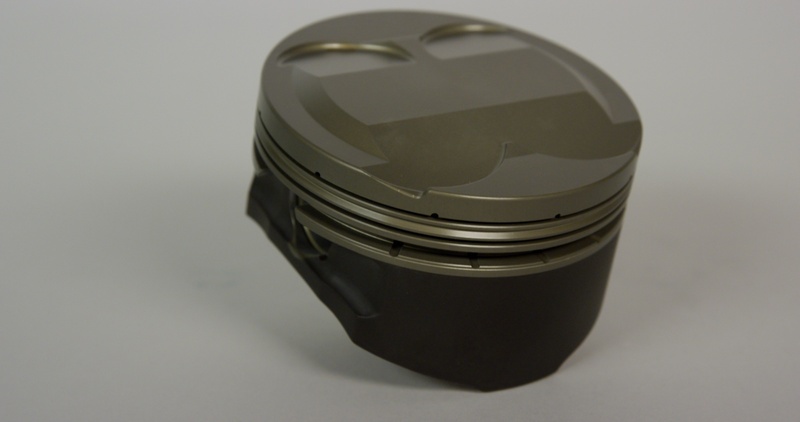 With a custom piston, there are options – so many options – and in this article we'll run those down for you, to leave you with a better understanding of how each option can benefit your engine program. Many times a simple $5 change can help get you what you need. Click here to learn more about $5 changes. JE Pistons stocks thousands of pistons in what is called the shelf stock program; each of which has been built for a high-volume application, such as those pistons built for a traditional small-block Chevrolet to Subaru EJ25 engines. 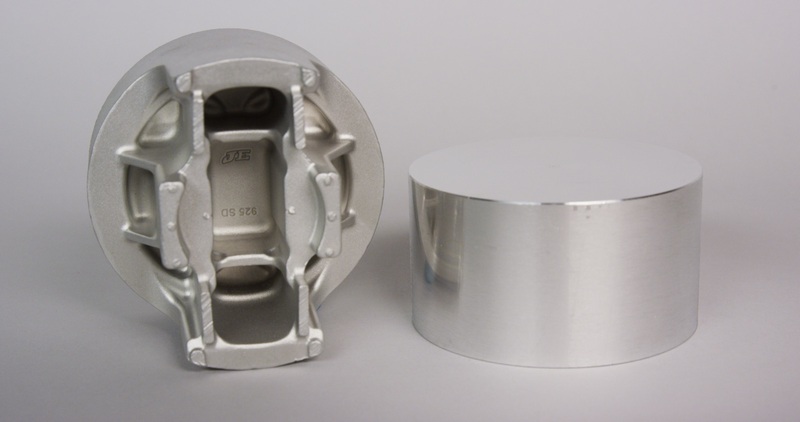 Many of the applications where shelf-stock pistons are traditionally used can actually share the same forgings, as the bore dimensions across some of these applications are very similar, as are the build requirements of the piston when it is complete. But when you're building an engine that's slightly off the beaten path, such as with the use of a less-common cylinder head, or one where there is heavy power-adder use planned, like a big hit of nitrous oxide or boost levels above and beyond those considered reasonable, then oftentimes a custom piston is just what the doctor ordered. Even so, these custom pistons may still be made from the same forgings used in the shelf stock program, as the basic piston dimensions – like pin height and bore size – may remain mostly unchanged, but can be altered within reason during the machining process to finalize the piston design to the required dimensions for the particular application. 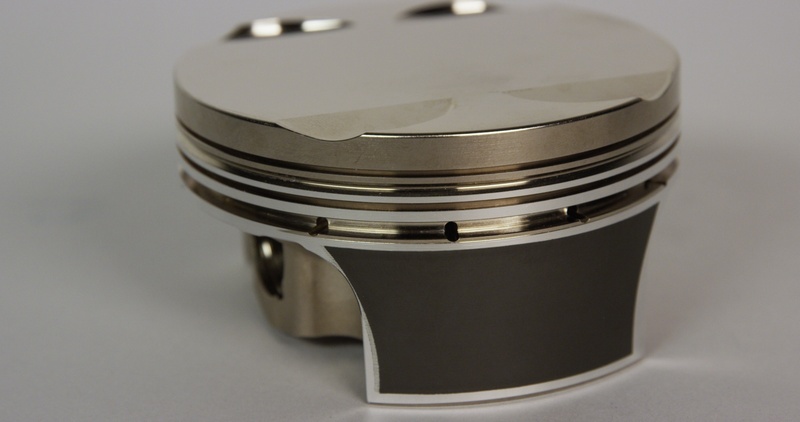 Billet pistons start life as a puck of 2618 aluminum whereas a forged piston is formed into a rough shape, which allows it to spend less time in a CNC machine. Our custom piston order form is required for custom pistons but if there's a reference engine application, you don't have to fill out every line. This billet Pro Stock piston features a 3D dome, vertical and horizontal gas ports. For a deeper dive, check out our Forged Versus Billet piston story. Over the last 70-plus years, the JE Pistons design team has seen just about any engine combination which can be dreamed up, and can likely support your engine build with a piston forging to satisfy the parameters required. A forged piston is the end result; it begins with a mechanical process which requires many hundreds of tons of pressure, whereupon a piston blank – which is shaped somewhat like a hockey puck – is preheated, then smashed into a shape which approximates the rough shape of a piston, then cooled and set aside until it is needed for a customer (unless it is a shelf stock part number). There are many steps to the machining process, but a quick rundown has piston blank going through the forging process, then to heat-treating, then into the the end-to-end machining following a trail where several steps all come together to produce a ready-to-run, fully CNC-machined piston at the end of the line. However, there also instances where there is not a piston forging to work with a particular engine combination, and that's where billet pistons come into the picture. For instance, when a race team is working with an engine program that has been specifically tailored to their needs – think Pro Mod with a 5.300-inch bore space 900-plus cubic inch nitrous engine – then a billet piston may make the most sense for that particular usage scenario. Many of those teams are constantly refining their engine programs and testing various configurations to develop the most efficient burn cycle and flame front. “The main advantages to choosing a billet over a forging are: first, that you don’t need to have a large quantity of parts to justify the cost of making a new forging die and second, any changes to the billet design can be made quickly compared to making a new forging die. No one would consider spending the thousands of dollars required to make a forging die to only make a few pistons. The billet process also allows us to test out potential forging designs before spending the money for a new forging die. 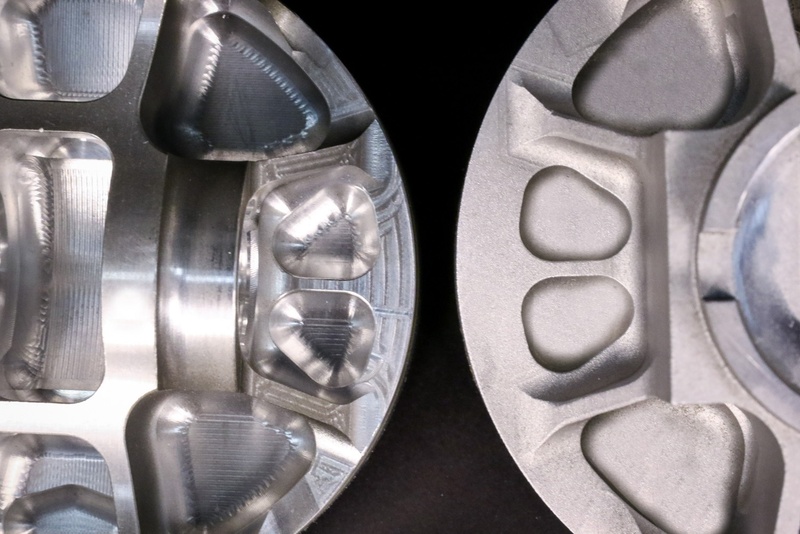 Using billets, we can manufacture the pistons and test them out in real world conditions before committing to the cost of making the new forging die,” says Eugene Henson, JE Pistons' Manufacturing Engineering Manager. In terms of construction, a billet piston starts out as a heat-treated puck, similar in shape to a hockey puck. But unlike a forging, all of the material in a billet piston that doesn't end up as part of the finished billet must be removed from the puck. So this requires a bit more engineering time to design the billet properly, and time from the CNC programming team to create accurate toolpaths to machine the puck into its final configuration. “If you are developing a racing program you can make slight changes to the strut angles, valve pocket locations, and virtually any part of the structure as you see fit. When working with a forging you are constrained to what the forging you start with can handle. If your engine needs a strut with a more diverging angle than the forging supports, the billet can be just quickly designed to accommodate,” says JE's Global Automotive Product Manager, Nickolaus DiBlasi. Billet pistons spend more time in a CNC machine than a forged piston since all details must be formed. A 9-axis Mazak Integrex has the ability to 'hand off' the part between both sides of the CNC machine automically to machine both the top and bottom of the piston. The time required for machining is a main driver of the higher cost of the billet piston designs at this time. Henson cautions that it takes considerably longer to take the extra material out of the nooks and crannies of the underside of the piston when compared to a forging that has already been pounded into a shape approximating its final configuration. “We also have to worry about the surface finish on the sides and in the corners of the under crown of the billet which can add additional machining time. 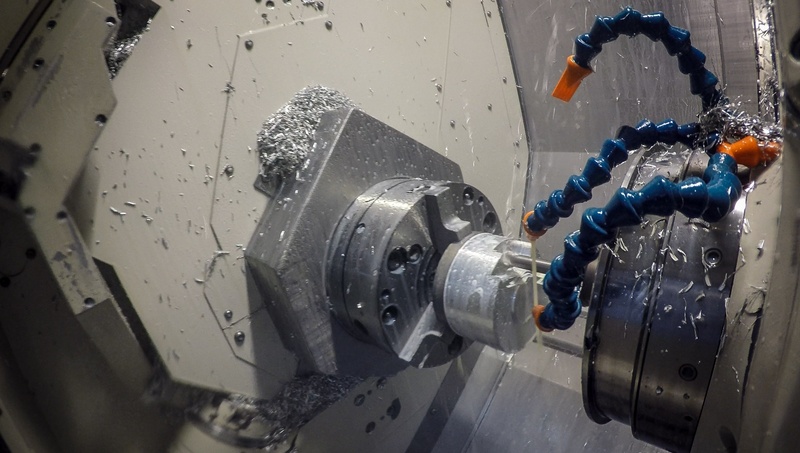 There is a considerable amount of skill and understanding of machining, tooling, and programming that is essential to achieving the required surface finishes on a billet part. Add to that that each billet design brings its own unique machining challenges,” he says. So for applications that are highly-specific, or those where there simply isn't an appropriate forging to use as a base for the piston's construction, then it absolutely makes sense to use a billet piston. But they aren't for everyone, nor every combination. “From the manufacturing perspective, the customer and engineering teams have more control over the piston's final design and configuration, but forego some of the material strengthening properties of the forging process,” says JE's Director of Operations, Jeff Lovell. Due to the added time required to complete a set of billet pistons, JE Pistons does require lead time to manufacture these. “We quote 10 days to manufacture non-stocking billets. This is in addition to piston manufacturing; which is quoted at 14 days. We do, however, keep some billets in inventory for immediate use. These are for repeat customers who give us a forecast of their future orders,” says JE's Stacy Rinas. Today's power-adder engines are more advanced than ever; engineering and manufacturing advances over the last several years have given racers the greatest products yet. 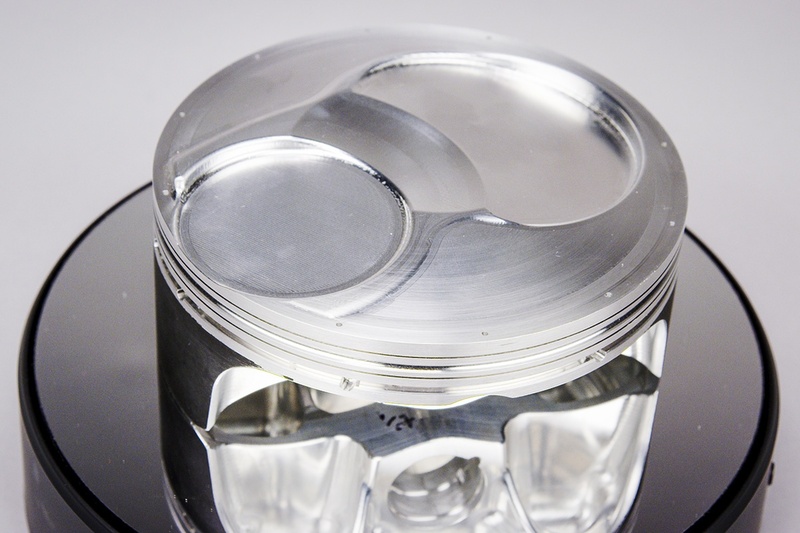 But they are still only as good as the weakest link, and in an effort to reduce the chance of that link taking the form of a piston, JE Pistons has developed a wide range of coatings which are designed to reduce the heat seen by the piston, improve lubricity, and provide other benefits to the end user. Ordering a set of custom pistons is as simple as providing JE's Engineering team with the measurements you require for your application. The order form can be found here and it will need to be filled out and delivered in order to begin the manufacturing process. If you're looking for pistons which are based on existing engine architecture, you can simply fill out the changes you need for your application. For example, if you're running larger valves, or you want to change the compression distance, you can simply specify those changes. And if you're not sure what you need, JE's technical staff is standing by to assist you with your order.